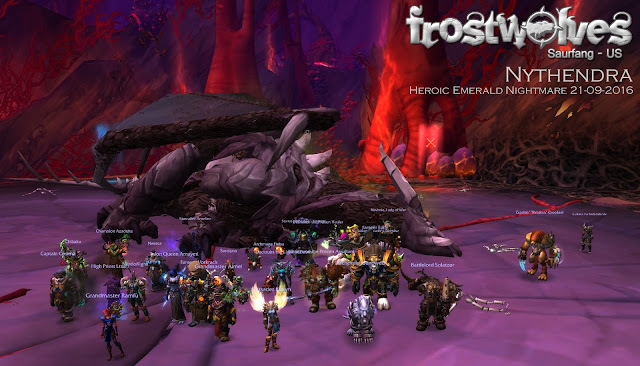 Raiding - Heroic Nythendra down! It was our first look at the new raid, The Emerald Nightmare. There had been a lot of discussion about what we were going to do - were we doing heroic or were we doing normal? Traditionally we had always started with Heroic, because it felt like the right challenge for our abilities, and we weren't going to change now. There was also another reason. It was Kyxyn's birthday. And he wanted to do Heroic. Who am I to go against the will of the Tyrant? The Emerald Nightmare makes me sad as a druid! Nythendra, the first boss, was once a member of the Green Dragonflight, and the guardian of the World Tree, Shaladrassil. When Xavius' nightmare consumed Shaladrassil, it consumed the sleeping dragon as well. Now she is a rotting husk of her former self, with bugs, pestilence and rot. Everyone was excited for raid, but the DDOS attacks did not make it fun for some raiders! We had a large turnout, with 25 people ready to go. It took a few goes for everyone to put their rot properly. I was an idiot and kept standing a little too long in the rot. Also, I was being silly and standing in melee. So I would end up with a lot of stacks. I moved closer to the tail end and backed up - heaps better. The second phase, where you dodge the big bad bugs exploding wasn't too bad. However, it took the rest of the evening to get the hang of dropping rot at the right spot and standing in the correct areas and eventually we got our kill! Saralynn got a Legendary! Some loot went around (I rolled a belt) and with only 15 minutes left in raid we went back and did it on normal. My mana is a huge issue. I wish I'd gone the lower branch of the artifact. Might have to go with Moment of Clarity for a while! Thursday raiding was ruined by a server reset in the middle of raid. And I played like an absolute twit. Again standing too long in bad and forgetting I didn't have germination and wasting mana leading to really LAME output. I will have to do a LOT better! We went for that big evil tree, Il'gynoth, which looks doable and I look forward to cracking at it. What traits are you missing from the bottom of the artifact? Congrats to you and your raid members Navie! I was excited to read this blog entry ever since I saw you tweet about raiding (been at work too much and I didn't get to catch up until now)! Super happy to read it went well and you guys got one down. Have you ever thought about streaming your raiding sessions? I know I'd love to watch! The fact that you can pinpoint your own flaws and know what to work on is a sign that you WILL improve. I believe! Best of luck getting the rest of them down! You guys got this! And as much as I'd love to pop back on to check the game, I'm only happy doing endgame --- and with our next raid tier coming out this Tuesday in XIV, I don't have time for both. (; w ;) We need more than 24 hours a day! For now, I will live through your raid posts, haha! Thank you Luluri! Oh my gosh my guild is not pro enough to stream a kill, you would just be going OMG you bunch of noobs what are you doing!!! I do however have a stream that I put up for guildies to watch our raid so the door isn't totally closed!